Home 1960s GoRetro milestones Mad Men Retro fads Retro food The Go Retro Summer Giveaway! 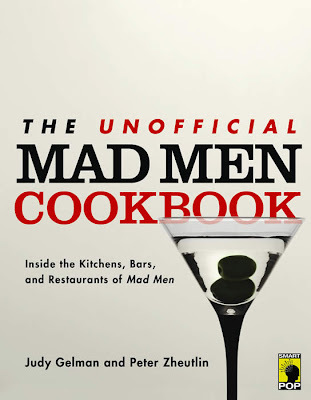 Go Retro turned five years old earlier this month, and to thank my retroholic readers for their patronage, I'm raffling off a small prize: The Unofficial Mad Men Cookbook by Judy Gelman and Peter Zheutlin. I reached out to the authors a few weeks ago and they graciously provided me with a free copy of this nostalgia-inspired cookbook. This book is NOT officially affiliated with the Mad Men series, but it does take readers into the gastronomical world of the early 1960s, with recipes to emulate the cocktails and culinary of the era and the show. With this book, you'll be able to mix an Old Fashioned to Don Draper's standard, or prepare Oysters Rockefeller guaranteed to make Roger Sterling vomit (that's not as insulting as it sounds; fans of the show know what I mean.) Swedish meatballs, Chicken Kiev (prepared with 12 tablespoons of butter--gasp! ), Turkey Tetrazzini, and Sour Cream Coffee Cake are just some of the more than 70 recipes the book dishes up. 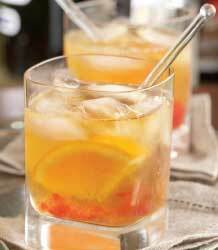 Of course, being Mad Men inspired means that there's an emphasis on luscious libations and appetizers. The authors set up the book with a nice tutorial on keeping a well stocked bar and the art of mixing drinks. Sprinkled throughout the recipes are historical anecdotes about established NYC restaurants from the 60s and descriptions of scenes from the show that featured food. I do have one small complaint about the book. Since it is a cookbook, it disappoints me that many of the dishes do not have accompanying photographs, except for a quick spread of selections in the middle of the book. It would be nice to see a full color photo for each prepared dish (and it makes it easier to locate a recipe when one is quickly flipping through the pages.) The other downer is the fact that no images from Mad Men could be included, since this is an "unofficial" cookbook not promoted by AMC. Still, The Unofficial Mad Men Cookbook is a swell bookshelf addition for anyone wanting to throw a retro themed party or just bring a taste of the era into their home. You can learn more about the book here. Want a chance at winning the copy of the book? Just leave a comment for this post (if you're anonymous, I must have a way of contacting you, so please include an email address where you can be reached.) You can also enter by tweeting about me or the blog -- be sure to include my Twitter handle, @GoRetroPam. I'll randomly choose a winner on Friday. Good luck! I need some retro recipes! Awesome. Is this open to your Canadian readers too? Very cool - my wife and I would supply plenty of pix! i am in and here i wanted to welcome you to the retro-zombie. i am diggin' your place. Chelly--yep, definitely! In fact, it's open to anyone overseas as well. Oh! Please, please please count me in!! !